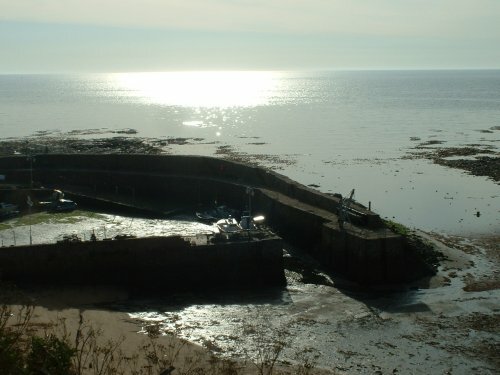 Crail is on the main coastal road through the east neuk and can easily be accessed by following this road from either east or west. The harbour is well signposted in the town and although parking is not allowed in the harbour area,plenty of street parking is a short walk away. This mark fishes all year round,but is especially productive in the winter time.Although an unlit pier,it is very short and is near street lighting. Good cod can be obtained here in the dark over the winter,with double figue cod likely when weather conditions are favourable.Easterly swell after a few days good blow are the best,and almost any point along the pier will be productive. Ground as you can see here is rough but not too bad and although you should tie up accordingly,you shouldn't lose too much gear. With the shape of the wall being as it is,you get a bit of shelter from the wind as well.